Every late January a small group of us meet up in Hart’s Restaurant in Nottingham. The food is always good and there is a small but idiosyncratic wine list with some interesting wines. This year was a bit special as Trevor was 80 – we are all January birthdays. 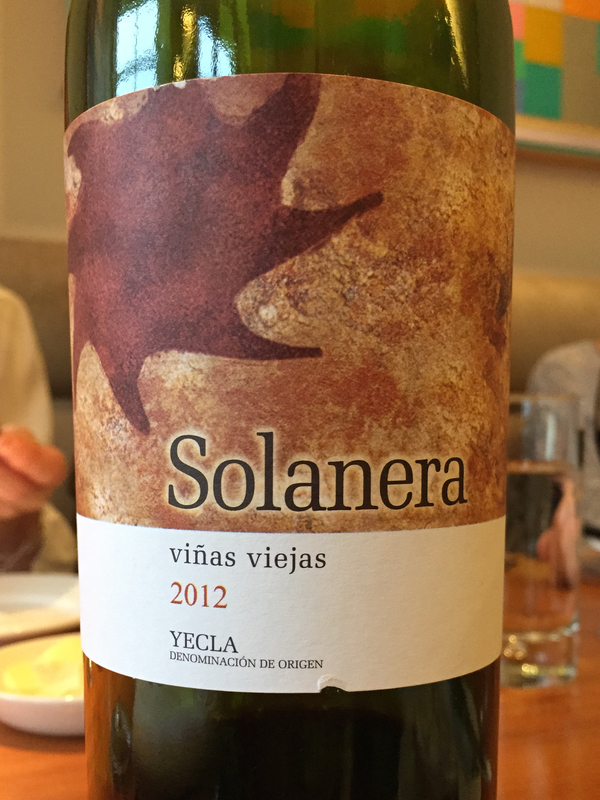 The wine drunk was the Solanera from Familia Castano in Yecla – a region which for a long time produced bulk wines. On holidays in Denia in the nineties – Yecla is inland – it was always a wine to avoid. However things are improving and this wine was a good example of that. The wine is a blend of 70% Mourvedre (or monastrell as it is known in Spain), 15% Cabernet Sauvignon and 15% Grenache aged 10 months in a combination of French and American oak. 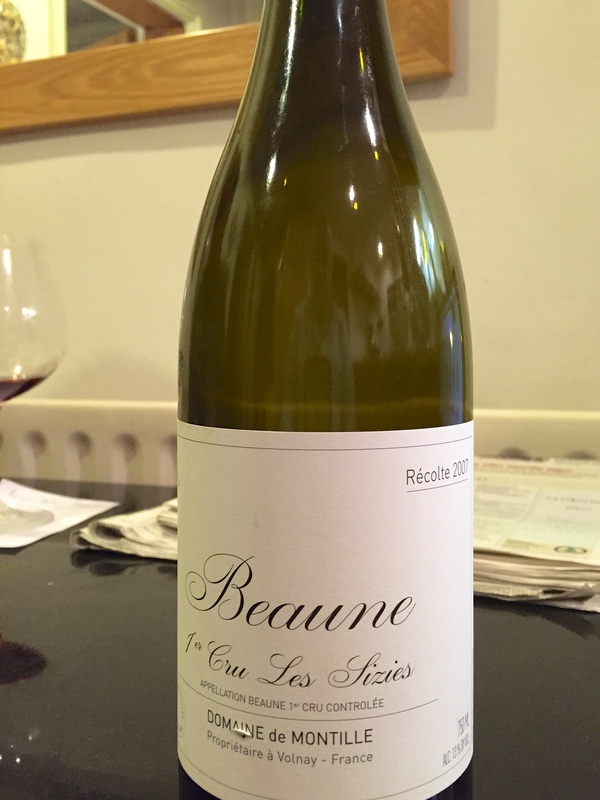 Robert Parker was very complimentary (94 points) and we all thought it was terrific – enticing nose, lots of fruit, ripe tannin, very Rhone-like with the other grapes making it subtly different. At about £11 retail (if you can find it) an absolute bargain. No Geoff this Friday as he was doing a wine tasting. 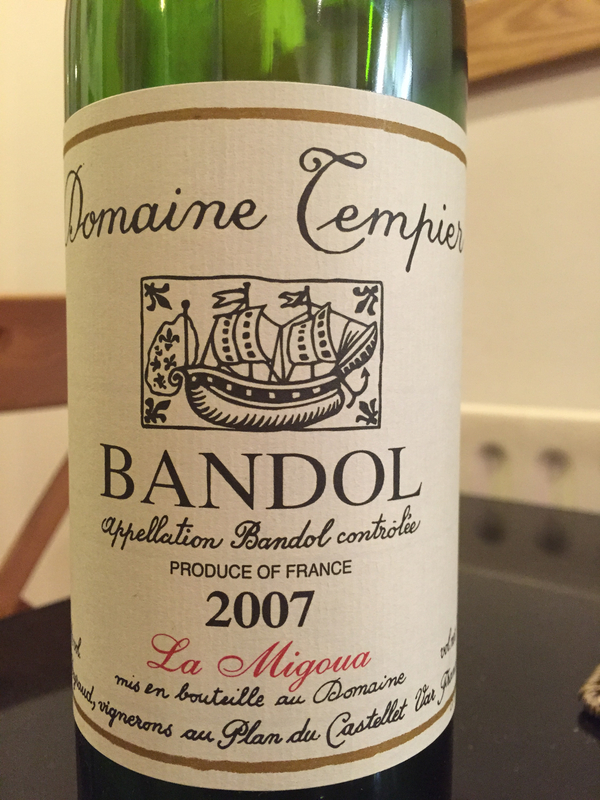 Wondering what to open I realised I had a half case of untried 2007 Domaine Tempier La Migoua, from Bandol in Provence (WS £30). This is another wine with plenty of mourvédre in the blend, usually around 50%, depending on the vintage, with 20% grenache, 26% cinsault, 4% syrah. So, a different assemblage with a slightly different taste although the presence of mourvédre in both was clear. The Migoua was possibly too young but was still a lovely, well balanced, classy drink. As to the difference in price – there was no difference in quality – the Domaine is very well known and in demand, whereas wines from Yecla are not yet in that position. After the tasting last week I thought I’d serve up a couple of previously tasted wines for Geoff to knock out of the ground but it didn’t work out quite like that. 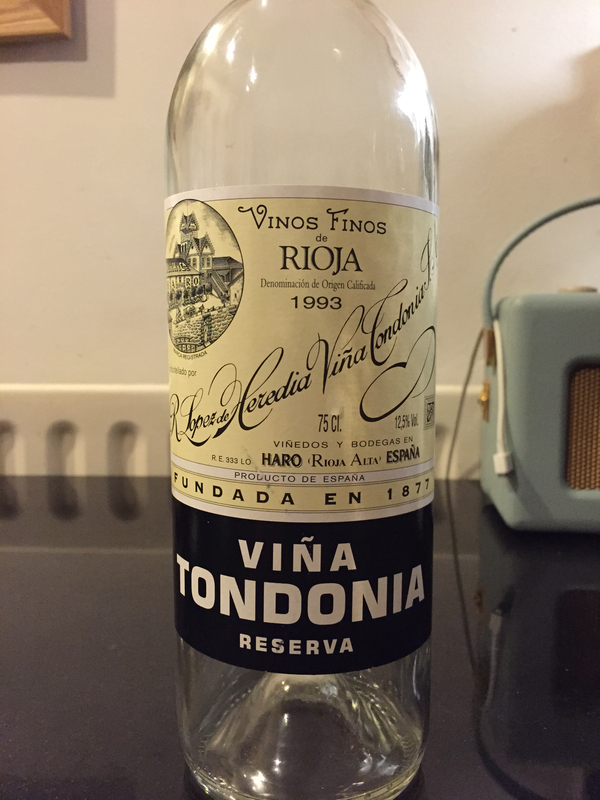 First we tried Vina Tondonia Reserva 1993 (WS £25, 12.5) from Lopez de Heredia in Rioja. A few months ago we drunk another wine from the same maker and enjoyed it greatly. Very old school and a unique taste. Unfortunately the nose – which is usually a giveaway – had a persistent cork taint which was slow to fade. In addition the nose was not as idiosyncratic as before. The wine was old gold, bright and clear in appearance with a fabulous acidity offset by some vanilla. Lots of savoury depth, albeit with no fruit left. A fascinating 22 year old but the various factors mentioned above made it hard to spot. 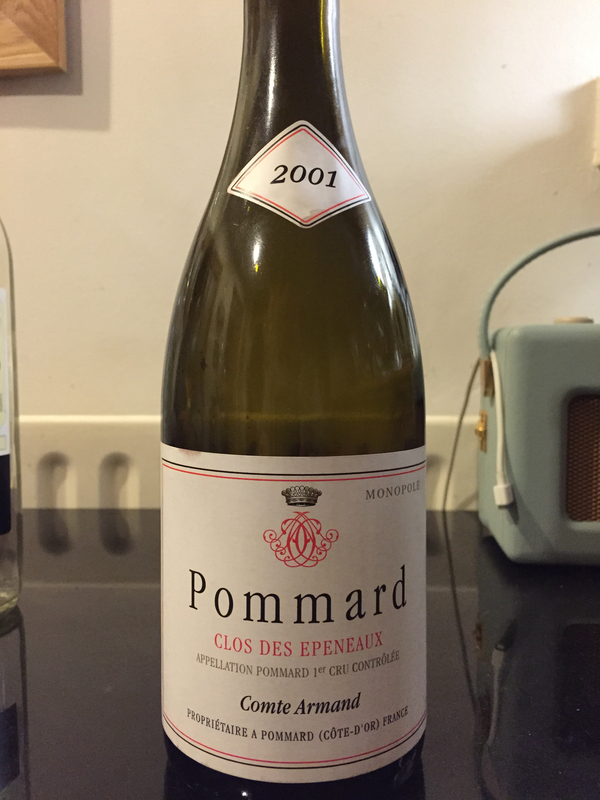 Secondly another retasting – 2001 Pommard Clos des Epenaux from Armand (WS £48). When tried nearly two years ago we thought this ‘rustic’ and possibly too young. On Friday, as before, the pinot nose and taste was muted, albeit recognisable, and the rusticity had gone leaving a smoky savoury note. A pleasant wine but, to repeat myself for the millionth time, a New World pinot at the same price would be a much better, indeed stunning, drink. So, the tasting didn’t quite work as intended. Over to Geoff. A lifetime ago, the small wine merchant I worked for bought a case of 1968 Chateau Calon Segur. A well-known vineyard but in a poor vintage meant that the buying price was low and our selling price reflected this. The wine was excellent and we subsequently sold many cases of this bargain; buying all we could until the suppliers eventually had no more. I think we must have been the only one to take a chance on this chateau’s poor vintage – and it paid off. (We tried another 1968, hoping for similar results , but it was poor). I must admit a blind spot for clarets, I don’t drink many and am not secure in my knowledge of the areas’ styles. St Estephe is reckoned to be the best value/least refined (?) of the four classic Medoc areas. 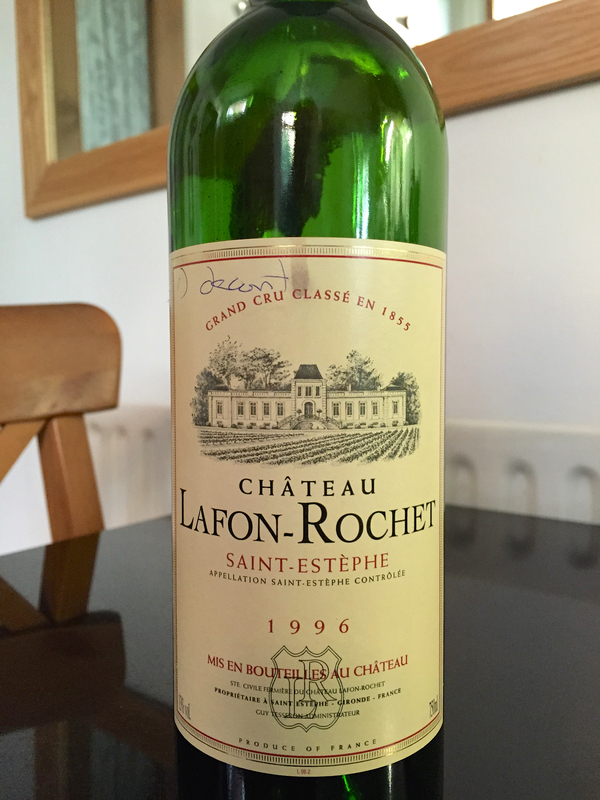 The wine we tasted was Chateau Lafon-Rochet 1996, a classified fourth growth. Tried blind, this looked black with a slight brick edge and smelt slightly minty. I declared Syrah and southern French on account of its rustic notes. (I was not having a good evening – see previous notes). It was not particularly refined on the palate, being rather undefined in style. It was a well made wine, structured and with good length but, for me, lacking in any particular memorable character. My Desert Island white wines? Rieslings and Chardonnays. You’d think I could tell them apart. Not so. … from Alsace. 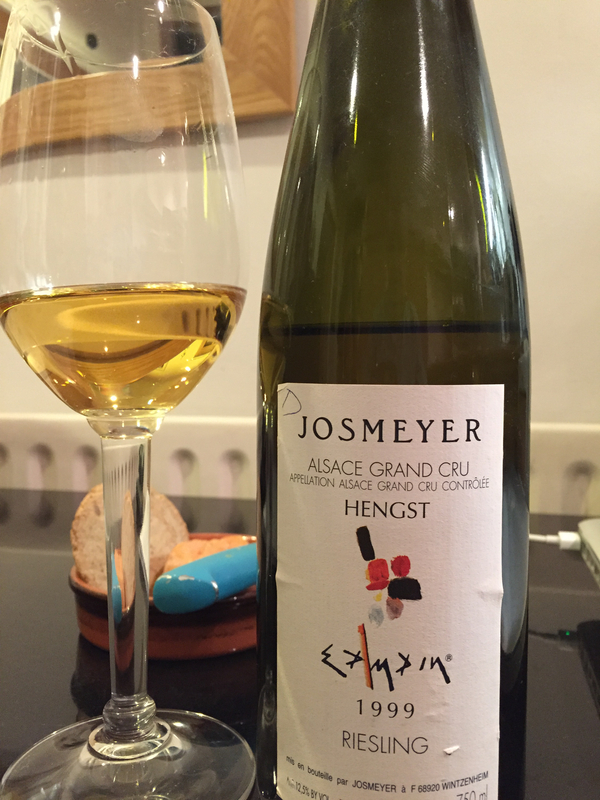 Josmeyer’s Hengst Grand Cru 1999. Only later did it start showing gentle aromatic petrolly notes. But very slight ones. Beautiful wine, great depth of flavours. Obviously, I’m in need of more practice. Cabardès. Somewhere in the south? Although I’ve been to France many times I would struggle to place Cabardès on a map but it’s actually a small appellation north of Carcassonne. 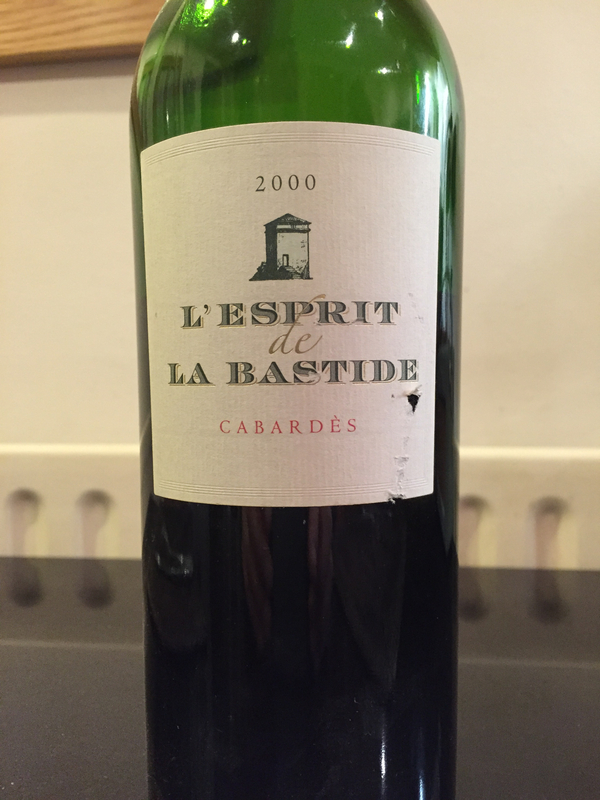 A few years ago we picked up a few bottles of L’Esprit de la Bastide, 2000 in a LeClerc hypermarché sale in Troyes. Dave remembers the cost as €10, I thought it was €6. Nevertheless we cleared the shelf but I only bought one, to my regret. The wine is the premier bottling (big heavy bottle) from the Chateau de Pennautier. Not easy to find out much about the wine but it seems to be a blend of syrah and merlot. I can’t improve on the tasting note at the linked site. Delicious wine and great value, even at the non-sale price, say around €15. However I can’t find any UK availability although the WS and others sell (well reviewed) Pennautier wines. Comments Off on Cabardès. Somewhere in the south? This time, a Christmas favourite – the pudding wine. The wine comes from Austria’s Burgenland in the south-east of the country where a lot of red wine is produced (see earlier blog). 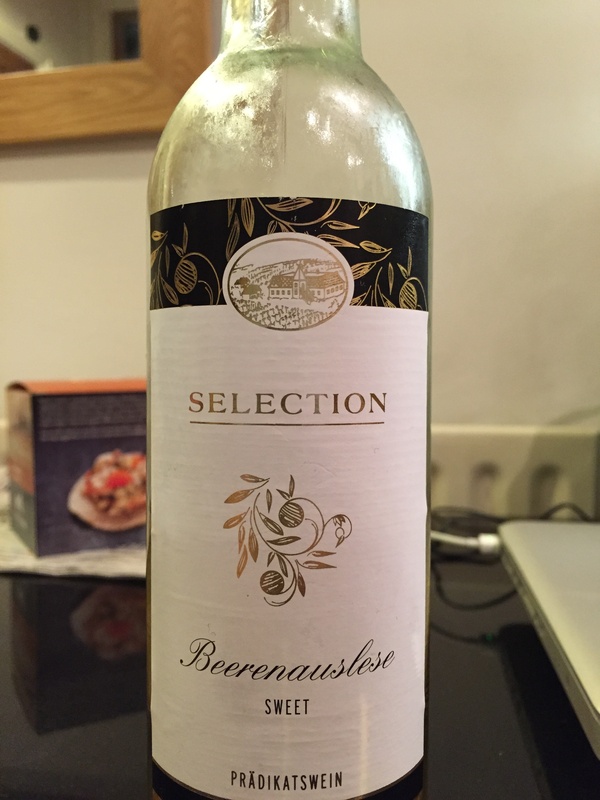 The wine is Aldi’s Austrian Burgenland Beerenauslesen which sells for £6 for a half-bottle. It is, surprisingly, non-vintage and has an ABV of 11%. The colour was a clear pale yellow and smelt of honey. The palate was raisiny with some balancing sweetness. It had a long finish and, although full of flavour, had a refreshing acidity which maintained our interest. We have become sophisticated in our appreciation of pudding wines (or ‘stickies’, a rather horrible neologism from Australia) but this would be equally as good, if not better, with a rich starter such as foie gras. A good value wine, not brilliant, but interesting and a fine food match. This was tasted an hour after being decanted and rather confirmed Richard’s 1st Rule i.e. that Pinot Noir smells better than it tastes. It was made by Domaine de Montille and was part of a mystery case form the Wine Society but Lay and Wheeler currently stock it at £28. Light red it had turned a brackish tinge round the rim but had an intriguing nose; its complexities being sweetness and gentle acidity, but with a depth that suggested more than cherries but not as deep as beetroot. The palate was certainly light in body, long and savoury but with not a lot of fruit and somewhat lacking in character. Evidently, the 2007 vintage was particularly wet up until just before the vendage then a long dry autumn followed which became a saviour for the growers. This excessive dampness may account for the lightness and rather hollow flavour and the wine may have been better with a shorter decanting period. In our opinion it’s rather over-valued at £28.